UK's first vinyl chart launches as sales hit 20-year high | What Hi-Fi? As the vinyl resurgence continues, the Official Charts Company has announced the launch of the first ever UK vinyl sales chart. The chart will track weekly vinyl album and singles chart, riding the wave of growth that sees vinyl sales at its highest in almost 20 years. 1.3 million vinyl albums were sold in 2014, the highest number since 1995. And the growth shows no sign of slowing down, with 2015 vinyl album sales up 69% and vinyl single sales up 23% compared to last year. The chart will launch on OfficialCharts.com, which also hosts the official charts for physical sales and streaming music. Vinyl still represents a small slice of the market but the category has seen impressive growth: 1.5% of UK album sales were on vinyl in 2014 compared to just 0.1% in 2007. The website also revealed the top-selling vinyl records of 2015 so far, with Noel Gallagher's High Flying Birds taking the top spot for albums and singles. The top five vinyl album chart also featured Led Zeppelin, Arctic Monkeys, Royal Blood and Public Service Broadcasting. The top five singles chart of 2015 featured two entries from Noel Gallagher's High Flying Birds, plus David Bowie, Mark Ronson featuring Bruno Mars, and Paul McCartney. Martin Talabot, chief executive, Official Charts Company, said: "Vinyl junkies could well have snapped up two million units by the end of this year – an extraordinary number if you consider sales were one-tenth of that just six years ago." All Time Low frontman Alex Gaskarth, the band responsible for this week's biggest-selling vinyl album, highlighted the variation in today's vinyl-buying audience: "What I love is that there are different worlds of vinyl fans; there’s the audiophiles who swear by the sound of vinyl, the people who like owning it as a collector’s piece, and then groups like our fans who buy a vinyl of our record simply so they can hang it on their wall." HMV, which became the UK's biggest physical media retailer over the Christmas season last year, reported a 170% y-o-y vinyl sales increase over the period. 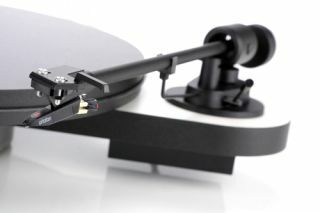 The news comes ahead of Record Store Day 2015, which takes place on Saturday 18th April and sees sponsors Rega offering people the chance to win a limited edition turntable.